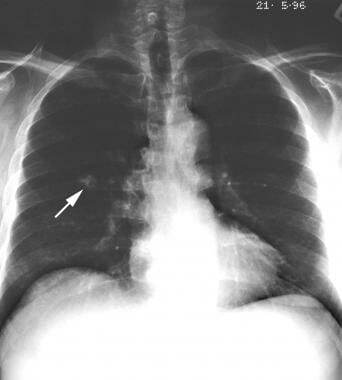 Posteroanterior (PA) chest radiograph in a man shows an incidental coin lesion in the right midzone with characteristic popcorn calcification. Accounting for 75% of all benign lung tumors  , hamartomas are composed of tissues that are normally present in the lung, including fat, epithelial tissue, fibrous tissue, and cartilage. However, they exhibit disorganized growth. Transthoracic ultrasonographic guidance may be employed in image-guided percutaneous biopsy of lesions in close contact with the chest wall. Ultrasonography may also be useful in the diagnosis of nonthoracic manifestations of a Carney triad. The 2 cases below illustrate that bronchial carcinoids can present as central obstruction, with the patients presenting with lobar collapse secondary to bronchial obstruction from a bronchial hamartoma. Pulmonary hamartomas are usually asymptomatic and are typically discovered as an incidental coin lesion on a routine chest radiograph. On chest radiographs, pulmonary hamartomas characteristically appear as well-defined, solitary pulmonary nodules; they may show varying patterns of calcification, including an irregular popcorn, stippled, or curvilinear pattern, or even a combination of all 3 patterns. When calcification or fat is detected in a well-circumscribed peripheral lung tumor, a diagnosis of hamartoma can confidently be made. However, the characteristic calcification is seen in only approximately 15% of patients, and detection of fat within a nodule is even rarer on plain radiographs. Popcorn calcification is virtually diagnostic. When a central lucency occurs in a hamartoma because of the presence of adipose tissue, the lucency may be misinterpreted as air within a cavity, resulting in a significantly different differential diagnosis. When no characteristic calcification or fat is identified in a coin lesion or when multiple lesions are present, the differential diagnosis is extensive. 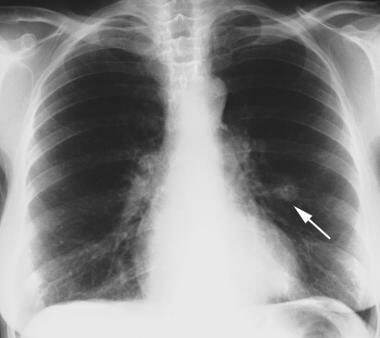 Posteroanterior (PA) chest radiograph shows an incidental finding of a solitary pulmonary nodule adjacent to the left hilum. Most lesions are smaller than 4 cm in diameter and well circumscribed; they are usually lobulated. The lesions show no lobar predominance, and cavitation is extremely rare. In unusual cases, bronchial obstruction occurs with a central tumor, causing obstructive pneumonitis, bronchiectasis, and progressive peripheral lung destruction. Serial chest radiographs may demonstrate slow growth. Rapid growth has rarely been reported. This feature may make the differentiation of a hamartoma from a bronchogenic carcinoma difficult. CT is the diagnostic tool of choice in the study of the internal characteristics of pulmonary nodules. CT scanning is more sensitive than chest radiography in the detection of fat and calcification. The main CT features suggestive of PH are intranodular fat and popcorn-like calcifications. The Hounsfield values for fat lie within the range of -50 to -120 HU. Fat is identified in 34-50% of lesions, and calcification is identified in 15-30%. Hamartoma may be confidently diagnosed when a sharply marginated, smooth lesion containing calcification and fat is identified on a CT scan. In one third of hamartomas, no calcium or fat is demonstrable on CT scans. The differential diagnosis is extensive in these cases. Central endobronchial tumors may have features that are indistinguishable from those of a bronchial carcinoid. Computed tomography (CT) scans obtained with soft-tissue and lung window settings confirm the presence of a well-defined nodule in the lingula, with a mean Hounsfield value of 26 HU; this finding was unhelpful. Findings from percutaneous, fluoroscopy–guided biopsy confirmed the diagnosis of pulmonary hamartoma. Nonenhanced, axial computed tomography (CT) scan through the midthorax shows a sharply marginated, smooth, fat-containing lesion in the right lung. CT scanning is more sensitive than chest radiography in the depiction of fat and calcification. Using CT scanning, hamartomas may be confidently diagnosed when a sharply marginated, smooth lesion containing calcification and fat is identified. Axial computed tomography (CT) scan just above the carina showing a giant lung hamartoma. Note the characteristic popcorn calcification. On high-resolution CT (HRCT) scans, fat attenuation is detectable in 34% of tumors, and fat and calcium is detected in 19%. The finding of fat and calcification together is a specific combination for hamartomas, particularly in tumors less than 2.5 cm in diameter. The frequency of calcification increases with increasing tumor size; calcification is found in only 10% of lesions smaller than 2 cm, but this rate reaches 75% for lesions larger than 5 cm. A paraganglioma that is associated with the Carney triad may be identified with iodine-123 or iodine-131 MIBG scanning. Radionuclide studies have no role in the diagnosis of a lung hamartoma. MIBG uptake may occur in other neuroendocrine tumors. Amini B, Huang SY, Tsai J, Benveniste MF, Robledo HH, Lee EY. Primary lung and large airway neoplasms in children: current imaging evaluation with multidetector computed tomography. Radiol Clin North Am. 2013 Jul. 51 (4):637-57. [Medline]. Trotman-Dickenson B. Cystic lung disease: achieving a radiologic diagnosis. Eur J Radiol. 2014 Jan. 83 (1):39-46. [Medline]. Ahmed S, Arshad A, Mador MJ. Endobronchial hamartoma; a rare structural cause of chronic cough. Respir Med Case Rep. 2017. 22:224-227. [Medline]. [Full Text]. Borghesi A, Tironi A, Benvenuti MR, Bertagna F, De Leonardis MC, Pezzotti S, et al. Pulmonary hamartoma mimicking a mediastinal cyst-like lesion in a heavy smoker. Respir Med Case Rep. 2018. 25:133-136. [Medline]. [Full Text]. Zakharov V, Schinstine M. Hamartoma of the lung. Diagn Cytopathol. 2008 May. 36(5):331-2. [Medline]. Jin MS, Ha HJ, Baek HJ, Lee JC, Koh JS. Adenomyomatous hamartoma of lung mimicking benign mucinous tumor in fine needle aspiration biopsy: a case report. Acta Cytol. 2008 May-Jun. 52(3):357-60. [Medline]. Wood B, Swarbrick N, Frost F. Diagnosis of pulmonary hamartoma by fine needle biopsy. Acta Cytol. 2008 Jul-Aug. 52(4):412-7. [Medline]. Guo W, Zhao YP, Jiang YG, Wang RW, Ma Z. Surgical treatment and outcome of pulmonary hamartoma: a retrospective study of 20-year experience. J Exp Clin Cancer Res. 2008 May 31. 27:8. [Medline]. Hutter J, Reich-Weinberger S, Hutarew G, et al. 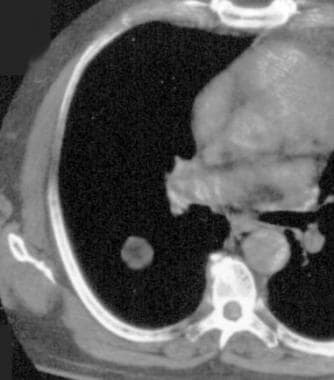 Giant pulmonary hamartoma--a rare presentation of a common tumor. Ann Thorac Surg. 2006 Aug. 82(2):e5-7. [Medline]. Kiryu T, Kawaguchi S, Matsui E, et al. Multiple chondromatous hamartomas of the lung: a case report and review of the literature with special reference to Carney syndrome. Cancer. 1999 Jun 15. 85(12):2557-61. [Medline]. [Full Text]. Valverde K, Henderson M, Smith CR. Typical and atypical Carney''s triad presenting with malignant hypertension and papilledema. J Pediatr Hematol Oncol. 2001 Nov. 23(8):519-24. [Medline]. Wales PW, Drab SA, Kim PC. An unusual case of complete Carney''s triad in a 14-year-old boy. J Pediatr Surg. 2002 Aug. 37(8):1228-31. [Medline]. Rodriguez FJ, Aubry MC, Tazelaar HD, et al. Pulmonary chondroma: a tumor associated with Carney triad and different from pulmonary hamartoma. Am J Surg Pathol. 2007 Dec. 31(12):1844-53. [Medline]. Carney JA, Stratakis CA. Familial paraganglioma and gastric stromal sarcoma: a new syndrome distinct from the Carney triad. Am J Med Genet. 2002 Mar 1. 108(2):132-9. [Medline]. Hochhegger B, Nin CS, Alves GR, Hochhegger DR, de Souza VV, Watte G, et al. Multidetector Computed Tomography Findings in Pulmonary Hamartomas: A New Fat Detection Threshold. J Thorac Imaging. 2016 Jan. 31 (1):11-4. [Medline]. Gleeson T, Thiessen R, Hannigan A, Murphy D, English JC, Mayo JR. 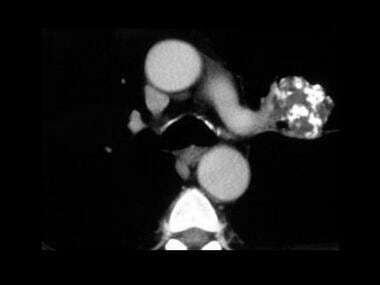 Pulmonary hamartomas: CT pixel analysis for fat attenuation using radiologic-pathologic correlation. J Med Imaging Radiat Oncol. 2013 Oct. 57 (5):534-43. [Medline]. Erb RE, Delbeke D, Falke TH. Magnetic resonance imaging of Carney''s triad. South Med J. 1994 Sep. 87(9):951-5. [Medline]. Freeman A, Weeden D, Wilkinson J, Kurukulaaratchy RJ. An unusual bronchial obstruction in a fit young man. BMJ Case Rep. 2013. 2013:[Medline]. Radosavljevic V, Gardijan V, Brajkovic M, Andric Z. Lung hamartoma--diagnosis and treatment. Med Arh. 2012. 66(4):281-2. [Medline]. [Guideline] Gould MK, Donington J, Lynch WR, Mazzone PJ, Midthun DE, Naidich DP, et al. Evaluation of individuals with pulmonary nodules: when is it lung cancer? Diagnosis and management of lung cancer, 3rd ed: American College of Chest Physicians evidence-based clinical practice guidelines. Chest. 2013 May. 143 (5 Suppl):e93S-e120S. [Medline]. [Full Text].